We are now in full swing with the Stone Fruit season; we have Peaches, Nectarines, Opel Plums, Apricots and some fantastic ruby red UK Cherries all in stock! Due to the short season of Greengages, you will need to get them while you can! Blackcurrant and Redcurrants are in stock, why not make a sorbet, Compote or even just to garnish. Broccoli is in very good supply, these green little trees are packed full of nutrients and a must order this week! Cavolo Nero is also known as Black Kale, Black Cabbage, the distinctive long dark green and almost black leaves look superb. 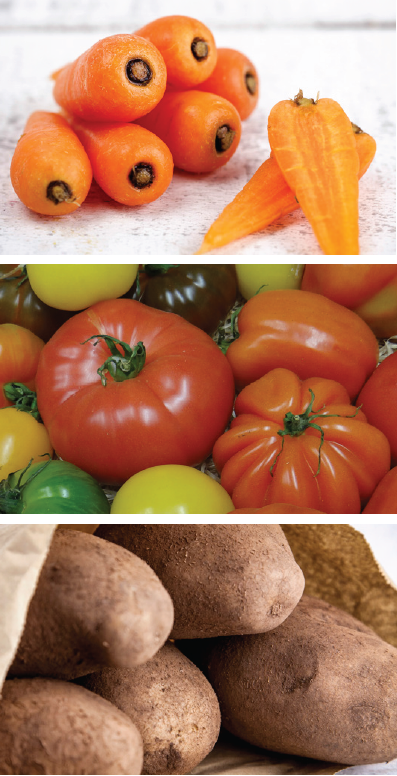 It is an extremely versatile vegetable with a rich, slightly intense sweet flavour. We are currently sourcing UK grown Curly Kale from Mudwalls Farm in Worcester. Courgettes are of a very good quality and size. Don’t forget we also sell Yellow Courgette and both Round Yellow and Green. Why not change it up? Courgette Flowers are very popular this time of year! Spanish Onions (Large Onions) have a great set skin and a lovely white flesh. Our Cornish New Potatoes are proving to be very popular at present; a great seasonal line! Lovely UK grown Broad Beans are bursting at the seams. If you don’t fancy Broad Beans, then why not check out our Runner Beans, which are the current pick of the crop! New season English Swede is available and a great staple root vegetable. Delicious mouth-watering fresh Corn on the Cob is looking great. We are now starting to see a consistent supply of lovely small Chantenay Carrots. We currently don’t have stock of English Heritage Tomatoes however, we do have French Heirloom in stock as an alternative, they are in 3KG. Due to recent hot/wet weather Loose Spinach has been problematic due to quality issues, we are recommending you purchase prepack. Our Micro Watercress is currently in limited supply, again this is due to recent hot/wet weather. Lambs lettuce has been temporarily delisted due to quality issues, we are reviewing this weekly and will keep you informed. 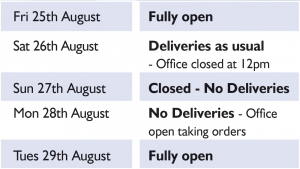 All bread must be ordered by 11.30am on Friday 25th August for delivery Saturday 26th and Tuesday 29th August 2017. We have moved onto New Season Chipping Potatoes, this has quickly been followed by new season Maris Piper Potatoes. Ware will shortly follow in the coming weeks. By the end of July we also have moved onto new season Jackets (Baking Potatoes). The Dairy Market is on the rise again and we do not envision that this will come down any time soon. The cost of butter has doubled since early 2016 which is due to the lack of dairy farmers and supply and demand. We are keeping a close eye on the market and will keep you informed with any changes. Have you received our new brochure yet? If not, please do let us know and we can get one sent straight out to you! Don’t forget to dispose of the old one! We have expanded the range by approximately 200+ products all available for next day delivery! 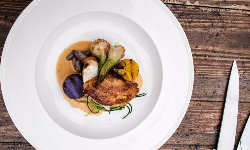 Roasted Supreme of Guinea Fowl with fresh Borlotti Beans and Golden Beetroot!